New Age Metals/Azincourt Energy Acquire Lithman West Extension, The 7th Lithium Project in Southeast Manitoba – New Age Metals Inc.
Lithium Canada Development is the 100% owned subsidiary of New Age Metals (NAM) who presently has an agreement with Azincourt Energy Corporation (AAZ) whereby AAZ will now commit an additional $250,000 in exploration expenditures and issue NAM an additional 250,000 shares of AAZ. This increases AAZ’s initial 50% exploration expenditure earn in for AAZ from $2.350 million to $2.6 million. This acquisition will also increase the shares to be issued to NAM from 1.25 million to 1.5 million, and adds an additional 2% royalty for NAM, for a total of seven royalties on the Lithium Projects in this pegmatite field. For additional information on the NAM/AAZ option/joint-venture see the news release dated Jan 15, 2018. The recent project acquisition of this new project has made the New Age Metal/Azincourt Joint Venture the largest claim holder of Lithium in the Winnipeg River Pegmatite Field as they are now in possession of an approximate total of 12,100 hectares (29,900 acres). At present, the Joint Venture has seven projects in the pegmatite field exploring for lithium-bearing pegmatites. AAZ has also agreed to increase the minimum exploration commitment for 2018 from $500,000 to $600,000. The 2018 budget will allow for 2 of the 3 drill ready projects to be drilled and preliminary field work and additional ground proofing to be completed on the project. On May 8th, 2018, NAM announced a $1.2 million private placement. For further details please click the link here. May 10th, 2018 Rockport, Canada – New Age Metals Inc. (TSX.V: NAM; OTCQB: NMTLF; FSE: P7J.F) is pleased to announce that through its Lithium Division, Lithium Canada Developments (LCD) it has acquired 100% of the Lithman West Extension Project, by way of staking, in southeast Manitoba. The project has good infrastructure and is located in a region known for mining in the province. The new Lithman West Extension Project consists of 12 claims for a total of an approximately 2725 hectares (6734 acres) (Figure 1). It is located approximately 4 kilometers west from the Tanco Mine Site. The world-class Tanco Pegmatite has been mined for Tantalum, Cesium and Spodumene (one of the primary Lithium ore minerals) in varying capacities, since 1969 at the Tanco Mine. Figure 1: Lithman West Extension Project Claim Outline: New Age Metals now owns 100% of 7 large pegmatite claims in Manitoba. A minimum of $600k has been committed for 2018 by NAM’s option/joint venture partner Azincourt. The Lithman West Extension Project is located west and south of the Lithman West Project that the company staked in 2016. 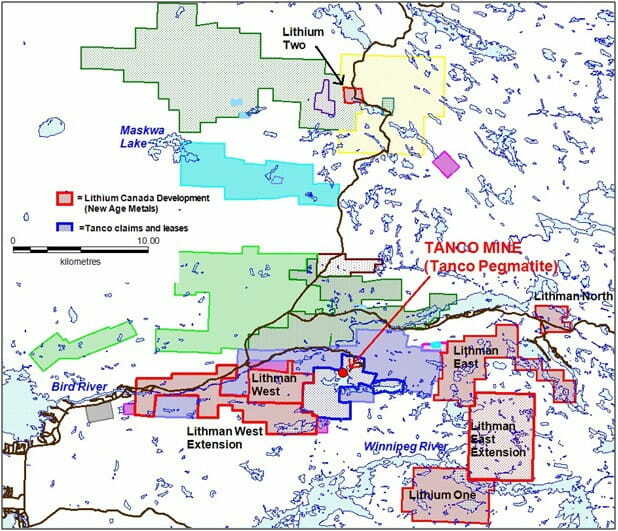 The two projects cover over 12 kilometers of continuous strike length of the Bernic Lake Formation (the geological unit/formation that hosts the Tanco Pegmatite and several other lithium bearing pegmatites). The Lithman West Project acquisition and staking was focused on covering all the synvolcanic intrusive units (gabbros and diorites) which is the host rock unit of the Tanco Pegmatite, located to the east of the project. The Lithman West Extension Project was designed to cover the remainder of the Bernic Lake Formation’s westward extent from the Tanco Pegmatite. The Tanco Pegmatite has been postulated to be situated in a limb of a fold. The axial plane trace of this fold runs through both projects and therefore the potential of the area to host a similar pegmatite such as the Tanco Pegmatite is the exploration goal of the Lithman West and Lithman West Extension. There also are several other axial planes of regional folds that run through the project area. In the area of the Lithman West Extension Project, several known occurrences of pegmatite exposures are present. The pegmatites in the southern portion of the project area are associated with what is deemed the Shatford Lake Pegmatite Group (one of ten pegmatite groups within the Winnipeg River Pegmatite Field). The Silverleaf Pegmatite on the Lithium One Project is also a part of the Shatford Lake Pegmatite Group and it is one of several pegmatites in the Pegmatite Group that contain lithium-bearing pegmatites. The pegmatites in this region of southeast Manitoba are described as being a part of the Winnipeg River Pegmatite Field. Several large lithium-bearing pegmatites exist in this region and exploration activity in the region is increasing (Figure 3). This pegmatite field is host to the world-class Tanco Pegmatite, which is a highly fractionated Lithium-Cesium-Tantalum (LCT Type) pegmatite and has been mined in varying capacities since 1969. The LCT-type pegmatites can contain large amounts of spodumene (one of the primary ores used in hard rock lithium extraction) and are a primary geological target in hard rock lithium exploration. They also can contain economic qualities of tantalum and cesium as well as other lithium bearing minerals such as mica. Figure 3: Idealized outline of the Winnipeg River Pegmatite Field and the location of the world-class Tanco Mine which has been in operation since 1969. Work permits have been applied for with the province of Manitoba for surface exploration. Once the permits are granted, field crews will be mobilized. Exploration on the Lithman West Extension Project will consist of prospecting and sampling the known surface pegmatites and their surrounding areas with the objective to outline new drill targets. The recent project acquisition of this new project has made the New Age Metal/Azincourt Joint Venture the largest claim holder for Lithium Projects in the Winnipeg River Pegmatite Field. At present, the Joint Venture has seven projects in the pegmatite field exploring for lithium-bearing pegmatites. NAM’s flagship project is its 100% owned River Valley PGM Project (NAM Website – River Valley Project) in the Sudbury Mining District of Northern Ontario (100 km east of Sudbury, Ontario). Presently the River Valley Project is North America’s largest undeveloped primary PGM deposit with Measured + Indicated resources of 160 million tones @ 0.44 g/t Palladium, 0.17 g/t Platinum, 0.03 g/t Gold, with a total metal grade of 0.64 g/t at a cut-off grade of 0.4 g/t equating to 3,297,173 ounces PGM plus Gold and 4,626,250 PdEq Ounces (Table 1). This equates to 4,626,250 PdEq ounces M+I and 2,713,933 PdEq ounces in inferred (see March 21st, 2018 press release). Having completed a 2018 NI-43-101 resource update the company is finalizing its 2018 exploration programs which will include geophysics, and extensive drill programs, which are all working towards the completion of a Preliminary Economic Assessment (PEA). Our objective is to develop a series of open pits (bulk mining) over the 16 kilometers of mineralization, concentrate on site, and ship the concentrates to the long-established Sudbury Metallurgical Complex. Alaska: April 4th, 2018, NAM signed an agreement with one of Alaska’s top geological consulting companies. The companies stated objective is to acquire additional PGM and Rare Metal projects in Alaska. On April 18th, 2018, NAM announced the right to purchase 100% of the Genesis PGM Project, NAM’s first Alaskan PGM acquisition related to the April 4th agreement. The Genesis PGM Project is a road accessible, under explored, highly prospective, multi-prospect drill ready Pd-Pt-Ni-Cu property. 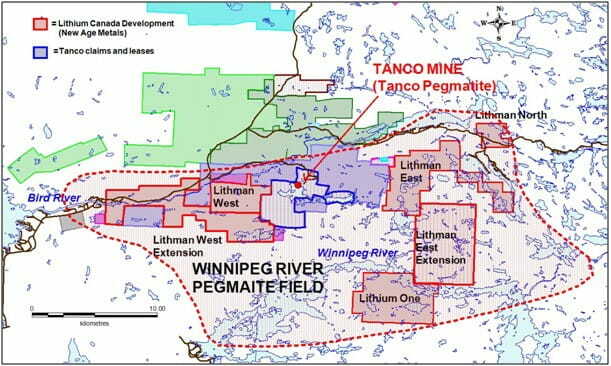 The Company has seven pegmatite hosted Lithium Projects in the Winnipeg River Pegmatite Field, located in SE Manitoba, with focus on Lithium bearing pegmatites. Three of the projects are drill ready. This Pegmatite Field hosts the world class Tanco Pegmatite that has been mined for Tantalum, Cesium and Spodumene (one of the primary Lithium ore minerals) in varying capacities, since 1969. NAM’s Lithium Projects are strategically situated in this prolific Pegmatite Field. Presently, NAM is the largest mineral claim holders for Lithium in the Winnipeg River Pegmatite Field. On January 15th 2018, NAM announced an agreement with Azincourt Energy Corporation (see Jan 15, 2018, Feb 22nd, 2018 and April 11th, 2018 Press Releases) whereby Azincourt will commit up to $4.35 million dollars in exploration, up to 3.5 million shares of Azincourt stock to NAM, up to $210,000 in cash, and a 2% net smelter royalty on all 7 projects. Exploration plans for 2018 are currently in progress, whereby a minimum of $600,000 will be expended this year. For complete details on the terms and conditions of the NAM/AAZ option joint venture please see the press release dated Jan 15th, 2018.